“Feet Critical for Jackson Lifestyle,” read a recent headline for the Jackson Hole News & Guide. Feet are critical for a healthy, active, and happy summer, no matter where you live. You may plan to hit the Fifth Avenue for shopping in New York City, hike Red Rock Canyon in Nevada, cycle Willow City Loop in Texas, or go horseback riding in Jackson Hole, Wyoming. A Red Rock Canyon hike would be no fun without perfect foot and ankle health. Enjoy a safe, active summer with these podiatrist tips. The Center for Podiatric Care and Sports Medicine in New York City offer the following tips for putting your best foot forward this summer. Summer Feet Tip #1: Wear the appropriate shoe for each activity. At our NY podiatrist clinic, we see tons of puncture wounds, lacerations, toe sprains, and fractures from people who were horsing around in improper footwear. Flip flops may be ideal for lounging around the pool and sport sandals function great on sandy beaches, but you don’t want to wear them wherever you go. Also, keep in mind that open footwear exposes you to dirt and germs, so you don’t want to choose this type of footwear if you have any cracks, cuts, blisters, or open wounds — all of which may offer a portal to infection. 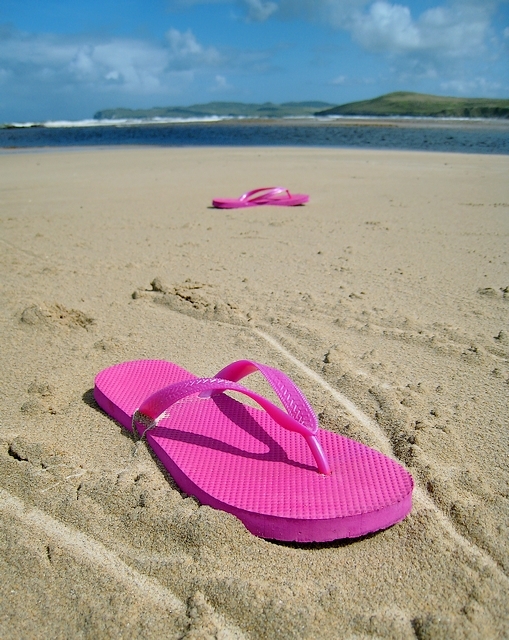 Leave flip-flops at the pool or the beach, where they belong. For other activities, find a more structured athletic sandal or a pair of runners. Summer Feet Tip #2: Protect yourself from puncture wounds. Expanding upon the last point, keep in mind that a pair of flip-flops will not protect you from puncture wounds that are all too common in the busy summer months. A pair of water shoes is a good staple to have on hand, because you never know what you’ll find at the bottom of a murky river, lake, or pond. If you do manage to step on something that stabs into your foot, you must see a foot and ankle surgeon within 24 hours. It’s imperative that the wound is sterilized and cleaned properly to prevent complications, such as soft tissue infections, bone infections, or damage to the foot’s muscles and tendons. If you haven’t had a Tetanus shot in the last 10 years, be sure you receive a booster from your doctor to protect yourself from blood poisoning. Puncture wounds can quickly take a turn for the worse if not treated by a medical professional. Summer Feet Tip #3: Travel smart. Many people decide to buy new shoes when they are about to go on vacation. Yet, this just sets you up for blisters, corns, and foot pain. It’s best to gradually break in shoes for at least a month before you plan to do any extensive all-day walking in them. If you’ll be on your feet a lot or flying for hours on a plane, our NY podiatrists recommend wearing compression socks, which will aid in circulation, reduce swelling, and help prevent blood clots. Pack an antifungal cream or powder to protect yourself from strange fungi you may encounter around hotel showers or pools. Also, bring a first aid kit with Band-Aids and Neosporin in case you get a blister or other small foot injury. Before you head off on vacation, be sure to get your compression socks. Pain is NOT normal. Many patients come to us in the summer, after months and months of suffering from worsening pain. They are often surprised how quickly the pain can be treated with something like custom orthotic inserts that can be added to any shoe. Our Manhattan and Westchester offices are both equipped to cast your feet and develop shoe insoles that correct biomechanical issues and treat chronic foot pain. We also offer many forward-thinking treatments, like low-pulse shockwave therapy, laser treatments, and platelet-rich plasma injections to speed healing. Schedule your appointment with a NY podiatrist today.